The killing of Austria’s Franz Ferdinand in 1914 helped kick off the Great War, or what we now know as World War I. Brutal fighting led to maimings and killings on a scale never witnessed before. Great Britain and France urged the United States to join them in the conflict, but most of America supported neutrality and peace. Author Marian Craig Wentworth decided to write a play promoting pacifism to such a degree that it would help lead to an end in ever going to war. Born in St. Paul, Minn., on Jan. 25, 1871, Wentworth graduated from the University of Minnesota, where she gained understanding regarding injustice around the world. She supported voting rights for women, freedom, and peace and justice issues, writing articles and giving speeches promoting her causes. Though she married Franklin H. Wentworth in 1900, she divorced him in 1912, moving to Santa Barbara in 1914. Once here, she began writing her most famous work, a one-act play titled “War Brides,” specifically for the great Russian stage actress, Alla Nazimova. Wentworth hoped that Nazimova’s powerhouse personality and the play’s strong message would inspire audiences to seek a permanent end to hostilities. Wentworth’s work appeared at the perfect moment for audiences craving peace. Century Magazine ran the full work in February 1915, followed shortly thereafter by a book. “War Brides” revealed the story of Joan, whose husband and three brothers are sent to the front during war. After hearing of her husband’s death, Joan considers suicide, before realizing she is pregnant. Military officials promote policies suggesting women marry young men leaving for the front, hopefully resulting in a new generation. Joan leads the village’s women in protest when the Kaiser comes to visit, resulting in her imprisonment. She forcefully refuses to bear more children until he promises there would be no more war, before committing suicide. The Los Angeles Times’ March 3, 1915, review called Wentworth a prophet, but didn’t think the message would prevent men from going off to war. Since “War Brides” was only 40 minutes long, Nazimova decided to make it her first vaudeville production, a dynamite way to end a show’s first act. The actress earned $2,500 a week performing in the show, while her husband, Charles Bryant, who played the husband’s role in the play, earned only $300 a week. The show premiered at New York’s Palace Theatre on Jan. 30, 1915, a major hit from its first performance. Nazimova and the cast received one of the longest ovations ever at the theater, with the audience spellbound by her performance. New York newspapers praised “War Brides,” calling it one of the greatest successes of her career. Sime Silverman in Variety called it, “Another stage lesson for universal peace, presented in a neutral country.” He noted, “…women make war possible, they give the country its soldiers – they should have a voice whether the men they give should murder and be murdered. That’s a new light on Woman Suffrage.” To help propagate the message to others, a lantern glass slide projected before the show announced that the story was printed in Century. 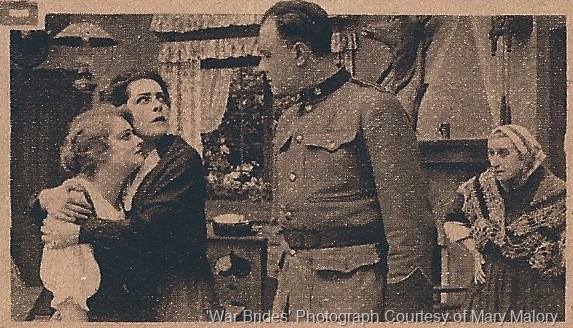 ‘War Brides” drew massive crowds wherever it played through October, held over virtually every time, with multiple ovations and curtain calls. The little one act overshadowed everything sharing a bill with it. The actress earned over $100,000 in 30 weeks performing the show in vaudeville, the most of any performer at the time. Film Fun magazine reported in late July 1916 that motion picture director Herbert Brenon had formed the Herbert Brenon Film Corp. in late July to produce this and other works, capitalized by film producer Lewis J. Selznick for $1 million. Selznick Pictures would produce and distribute the company’s films. Brenon leased the Ideal Studios and Laboratory in Hudson Heights on the Palisades. By August, he had signed Nazimova to star in a film version of “War Brides.” The actress would earn $60,000 for her first film role, shot over five weeks. Because of the play’s short length, Brenon enhanced the story by expanding ideas only suggested in the play, especially the love story between the heroine and her husband. He also focused on the drama at home, shooting virtually no battlefield scenes. Though the stage production ran only 40 minutes, the eight-reel film ran almost an hour and a half. Moving Picture World’s Dec. 21 review stated that “War Brides” dramatic moment “reaches a tragic height never before attained by a moving picture.” It considered the ending like a flash of lightning and one of the most powerful ever seen on film. Some magazines and newspapers speculated the film would lure a higher class of patron to movie theaters, those interested in stage productions and thoughtful material. They noted that many audience members attended vaudeville for the first time when seeing Nazimova perform “War Brides” on stage, and were now coming to see the well-praised film. Some, like the Times, also noted it couldn’t sustain the short play’s theme in its’ extended vision. Several theater owners thought its powerful message would prevent recruiting, and some states banned the film because of its peace-loving nature. One of the film’s young male performers, Richard S. Barthelmess, had performed in films during college vacations. His mother had coached Nazimova in her American debut, with Barthelmess knowing the actress for most of his life. This motion picture helped push him to the forefront of male ingénue roles. Playwright Wentworth would continue writing on freedom, rights, and women’s issues, with her play, “If Everybody Had a Window in His House” premiering at the Pasadena Playhouse on Jan. 19, 1925. She would also continue giving lectures, performing readings, and directing plays until her death in 1942. Director Herbert Brenon described “War Brides” as one of the most satisfying and best memories of his long filmmaking career. Nazimova also possessed high regard for it. Unfortunately, “War Brides” is considered a lost film, but hopefully future discoveries will unearth this treasure, one of the first anti-war and pacifist stories ever put on film. This entry was posted in 1916, Film, Hollywood, Hollywood Heights, Mary Mallory, World War I and tagged 1916, film, hollywood, Hollywood Heights, Mary Mallory, World War II. Bookmark the permalink. “…some states banned the film because of its peace-loving nature”. I wonder if America would allow such a film today? We are not the most peace-loving of nations. Are we? As I read your article, I could barely contain my urge to see it. Imagine my shock when I got to the part that read “…..War Brides” is considered a lost film…..” Talk about a major letdown. Perhaps the original stage script is on eBay? The stage script is for sale from time to time on ebay; I bought one about 8 years ago.